Every woman from time to time will experience a "bad hair day"; however continuous bad hair days resulting from thinning hair can be psychologically devastating. Whether you are eight or eighty, if you suffer from thinning or balding hair due to any variety of reasons, you are not alone, and you have options! Changing Headlines has been a part of the Fox Cities community for over thirty seven years. We have worked with hundreds of women with alopecia, thricholomania, cancer, and genetically thinning hair. Our consultations are always private, confidential, and complimentary. 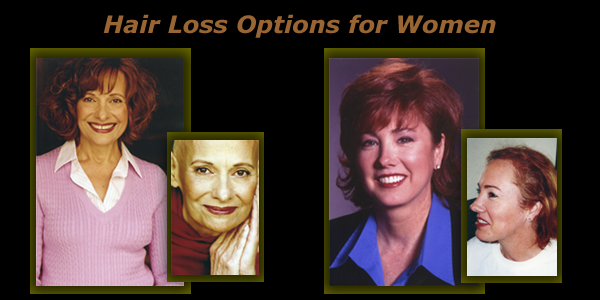 Wigs are designed for women with extremely thinning hair or no hair. We offer the highest grade of synthetic and human hair wigs. Our synthetic wigs are hand knotted, light weight, and have a sheer top for added styling options. Our human hair wigs are absolutely gorgeous and we offer a variety of lengths, textures and colors. Human hair wigs allow you the option to use both curling iron and flat iron when styling. This is an exciting, revolutionary option for women in the early stages of hair loss. For the right candidate, Laser Hair TherapyTM can stop hair loss and help return it to when it was once healthy, strong and manageable. This treatment is incredible because it's your own hair growing. This is a great option for women with thinning hair or hair loss over the entire scalp. Virtual Reality is human hair that is not affected by swimming, showering, or wind. Virtual Reality is the closest thing to having a normal, full head or hair, without limitations. The hair literally appears to be growing out of your scalp-even under a microscope! It virtually gives you a new, healthy head of hair. This is designed for women with hair loss confined to the top of the head. The extension is easy to use, available in human or synthetic hair, and is matched perfectly to your own hair. Hair extensions are best for women with hair thinning equally throughout the head or women with no hair loss, seeking length. Our extensions are always the highest quality human hair, and are absolutely stunning. They come in un-limited colors and textures. Highlights can be added and your hair can be styled any way you desire.